These forums have always been invaluable to me in the past so I thought I would throw my latest problem out there and see if anyone can help. I would also like to point out that I have done much searching on the internet and have found many conflicting opinions regarding pizza dough/bases. I have taken to rolling the dough out on baking paper which definitely helps but I still get very thick edges and it is always shrinking back. Then of course it all puffs up in the oven. It tastes great, my wife loves it but it is far too bready for me. You get full quickly. I have used three different recipes, one was from Jamie Oliver's Italian book using strong white bread flour, another was from the same book using just '00' flour and the third was from Bertinet's 'Crust' or 'Dough' - I forget which. They all give me the same problem so I am reluctant to believe it is a recipe problem. Where I think I am going wrong: - many people say you must rest the dough if it is shrinking back etc. Unfortunately we don't always have a lot of time as either my wife or I are going back out again for the evening so time is sometimes quite short. Once my batch of dough is made, I separate it into balls and freeze it. On the day of baking I take the dough out of the freezer in the morning and leave it on the kitchen side all day. When I get home from work it has puffed up a lot. I deflate it and start the painful process of getting it thin. I tend to think it has all day resting and so I just get on with it - perhaps this is where I am going wrong. I have also tried defrosting it in the fridge but of course it is very cold when I get home and I just don't have an hour or so to get it to room temperature. I have never tried making the pizzas as soon as the dough is ready - it always get frozen - could this be my first problem? My dough is NEVER like the dough on youtube where they just hand stretch it to super transparency. Mine fights me. 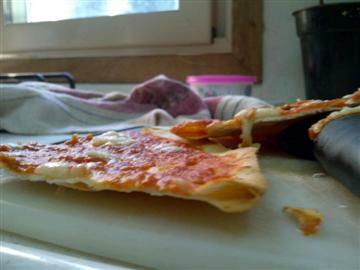 There are a few recipes online for no-rise pizza dough. like here and here. You make the dough, stretch it and bake it. This appeals to me as I am low on time. Is the rising period just for developing flavour? Can you skip this part and still get a decent pizza base? Would the fact that there is no initial rise keep it thinner in the oven and stop it puffing up quite so much? So to simplify - 1.I have never been able to produce a thin pizza base with my hands or a rolling pin - they defy me every time. 2. Even when I get the base as thin as I can manage it rises in the oven and becomes quite bready (more like a deep pan I suppose). This could be because it wasn't thin enough to start with. See problem 1. Cracker Style? Here's one of many. Pizza is generally made with an average gluten flour, not a strong one. Strong flours need very long rising times or they result in chewy crumbs, at least when used in bread and pizza. One more observation: re-reading your post it seems to me that you don't let the dough rise before freezing it, correct? If so... make it rise once and you will surely find your dough much more manageable and light. layers of dough. To acheive this I refrigerate the dough over night after the first rise.The next day the dough is stone cold and not the least elastic. I can roll it out to less than an eighth inch thick and cut the sheet into the triangles I want to roll up for the rolls. You simply can't do this with wam dough. When I make pizza I do the same proceedure but with much smaller batches of dough. Dough will keep nicely in those plastic bags from the produce department if the bag is oiled a bit on the inside. Based on your description I think the problem is your recipe. Care to share it with us? 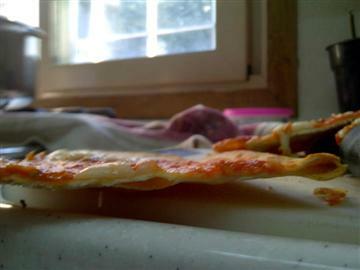 My dough is highly extensible and very thin, windowpanes with no problem. I do exactly the same freezer approach: leave the frozen dough balls in a plastic bag on my counter in the morning, so when I get home in the evening, it's ready to go, all I have to do is preheat the oven, stretch and bake. For a thin crust 14" pizza, you'll need a final dough that weights between 400-425g. That will be pretty thin. Use the pizza calculator on pizzamaking.com to create a receipe that has hydration between 61-64%; these are values that I've found work best. You should use very little yeast, less than 1% no matter what! If you like, add a little oil, maybe 3% to start and work your way up. For salt, 2% is a good place to start. After mixing dough, you can refrigerate it or freeze it right away as you already do, and bake as you described. bake at as high as your oven will allow (I bake 550F); this is really important! One of the best pizza making tools I ever bought was a pizza screen like this one. Helps pizza keep shape and promote a crispy crust. I usually bake fo a few minutes on the screen (about 5-6 minutes), then remove the screen and place the pizza direct on the stone for 2-3 minutes. Have fun, and let us know how your revised pizza turns out. I have never made pizza crust from anything BUT high gluten flours. If it's snapping back you need to let the dough rest. I use the basic New York style recipe at pizzamaking.com. There are several recipes for thin crispy crusts there (NY style isn't really supposed to be crispy but it turns out that way if you don't let it rise 24 hours in the fridge). Every pizza dough recipe that I've ever found to be any good requires at least some period of rising. The one I most commonly use requires a 24 hour rise. I usually make it in the morning, let it rise til doubled (about 2 hours), punch it down and put it in the fridge to complete the rise. I remove from the fridge at least an hour (preferably 2) before baking in the evening and it has worked well for me that way, if not quite as flexible as NY style crust is normally expected to be. You can make the dough, let rise in the fridge for 24 hours, then divide and freeze in 1 pizza size portions. I don't know how long it would take to thaw; this dough doesn't keep in the fridge more than a couple of days. Even the recipe on the King Arthur website needs at least a 2 hour rise before baking. I no longer roll my pizza dough out since I started using the NY style recipe on the pizzamaking website. I stretch it by hand. After it's stretched out, I've found that if I cover it with plastic and let it rise I get an acceptably chewy crust; if I top it immediately and bake on a preheated stone I get a crispier (though not cracker like) crust; and if I parbake it I get a puffier crust that ends up being a little soft and bready. All 3 are fine, just depends on what you're in the mood for. That's for dough made in the morning and baked the same day. Echoing mrfrost, you need to dock your dough. If you don't know what a dough docker is, google and you'll find a slew of examples. You can get one from Amazon.com for less than $10. If you don't want to spend the money, use a fork and pretend you're pricking a pie crust before putting it into the oven to bake. (NOTE: the docking should be done right before you put your sauce/toppings on the pizza. Second, if the dough seems too tight and elastic when you stretch it out, simply cover it with a towel or plastic and leave it alone for 10 minutes. You'll find when you come back that it's relaxed enough to allow you to enlarge it. Sometimes you may have to repeat this procedure a couple or three times to get the dough to the desired thinness, but it will work. My Pizza bases improved as soon as I began using less water and less yeast. I was making the dough the day before but this always necessitated knowing in advance that we were going to use the wood fired oven the day before. Now I make the dough the morning of the same day at around 8 or 9 am using just enough water to make a pliable dough and just enough yeast so that after 6 hrs in the fridge, the dough will rise sufficiently in 2 hrs once it comes out. rest on benchtop 10 mins then divide into 5 lumps, roll each into a ball then place into greased plastic container and into the fridge for 6 hours. Take out 2-2.5 hrs before making the pizzas, flatten out to a 6" disk and leave on benchtop for an hour covered. Flatten out further to around 10 " dia and cover. Leave to puff up slightly until ready to make pizza then roll out to 14 inches dia. This method permits leaving the 10" bases on the benchtop with only a light dusting of flour and still they will not stick. They can be handles with minimum flour and semolina flour on the peel because of the low water content. I think the low water content also gives a crust that bakes quickly, is always firm ( not droopy pizza slices) and crisp to the bite. An even better way is to add a third step to the bases by rolling them out to final diameter of 15 inches 1/2 hr before baking. Of course this will give a puffier final base when cooked, and is the best, but a little more difficult to transfer to the peel so you have to use paper, or something to facillitate this. Thank you for all your very helpful comments. Some great ideas. I will experiment with all your suggestions (I like trying all the options to see what works best) and see what happens. I tried it once with just bread flour and once with just 00 flour. I DIDN'T use that much yeast. I used one sachet (7grams). The recipe has one rising of about an hour until the dough doubles in size. recipe looks pretty good: hydration, salt, oil seem good. Maybe a touch more salt, to your taste of course. yeah, originally waaaaay too much yeast! you're right about cutting it back to 1 packet, especially if you're going to leave it on your counter all day. maybe try a lower gluten flour, like an all-purpose flour? I think certainly with the semolina you'll get a really hard, tight dough. Well, there are all kinds of advice out there! Many variations in flour, time, hydration, yeast, etc. I like a high hydration dough which stretches thin easily. I stretch it by hand, dock it and bake it for about 5 minutes. (It 'bubbles' but it's not bready.) Then I top it - lightly - and finish baking. Some of the nicest surprises I've had in baking have been the times I tried something completely different and didn't think it would work...and lo and behold!